American DJ Mega Flat Pak 8 DJParts - All Variety of Parts that DJ Needs. The ADJ Mega Flat Pak 8 is a convenient solution for the mobile entertainer to provide Pure Lighting Excitement at any party. It includes eight (8) of the popular ADJ Mega Par Profile LED Wash Fixtures, seven (7) DMX connector cables, and a soft carrying case to protect your Mega Par Profiles during transport and dust-free while storing. The Mega Par Profile slim design and vibrant RGB output is perfect for Uplighting, stage washing and wall washing. The carrying case easily fits eight Mega Par Profiles and the DMX cables, plus a space for a small LED Controller (controller sold separately). 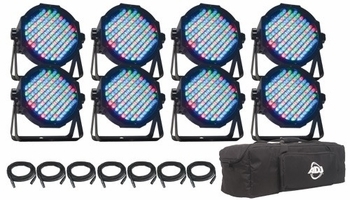 System Includes: • 8x Mega Par Profiles • 7x (2m/6 ft) DMX Cables • 1x ADJ Carry Bag Fixture Specifications: • Ultra bright slim flat black Par with 108 10mm LEDs (26 Red, 46 Green, & 36 Blue LEDs) • Smooth RGB Color Mixing (fast or slow color change operation) • Great as an architectural wall wash or for performance stages where traditional stage lighting emit a lot of heat onto performers • Power & DMX Ins/Outs sit sideways so the unit can be set flat on the ground or set inside truss • 7 DMX Channel modes: 1, 2, 3, 4, 5, 6 or 7 channel modes • 5 Operational modes: Auto mode and sound active feature with built-in programs • Stand Alone or Master/Slave Configuration • Beam Angle: 30 degrees • 32 built-in Color Macros • DMX-512 protocol • LED & Pulse strobe effect • Linkable via 3-pin XLR cable • Electronic Dimming: 0-100% • Flicker Free • Dual scissor yoke allows fixture to be hung or set on the ground • Long Life LEDs (50,000 hrs.) • Power Draw: 18W Max (Each fixture) • IEC AC input and output on rear to daisy chain power • Compatible with ADJ LED RC wireless infrared remote control up to 30 ft./ 10M (sold separately) • Multi-voltage operation: AC 90V-240V 50/60Hz • Dimensions - Each Fixture (LxWxH): 9” x 8.75” x 3.5”/ 225x220x85mm; Bag (LxWxH): 32.75” x 9.5”x 9.25”/ 830 x 240 x 230mm • System Weight: 27 lbs./ 12 kg.